Dr. Haidry is a Consultant Gastroenterologist and interventional endoscopist at University College Hospital, London. He trained at St Mary's Hospital in London and completed his Specialist Gastroenterology training in North East London. He was then appointed to a two-year academic fellowship at UCL where he examined state of the art and innovative diagnostic and therapeutic endoscopic techniques for the diagnosis and treatment of early cancers arising in the gastrointestinal tract. He was appointed as a consultant at UCLH in 2011. He is the director of endoscopy for the division of gastroenterology at University College Hospital and leads the upper GI interventional endoscopic unit. His main interests are pre-malignant and malignant disorders of the upper gastrointestinal tract, with a particular interest in Barrett’s and Squamous neoplasia, oesophageal cancer and advanced interventional endoscopy. His main areas of interest and clinical research focus on novel and innovative endoscopic imaging techniques and therapeutic endoscopic approaches such as endoscopic resection, radiofrequency ablation, cryoablation, endoscopic ultrasound and complex stricture management. He has an academic position at UCL exploring existing and novel endoscopic imaging technologies for detecting early cancers. His other main research focus is minimally invasive techniques for treating cancers of the upper gastrointestinal tract and metabolic endoscopy. He is active academically and continues to lead and be involved in several national and international clinical trials in these fields. 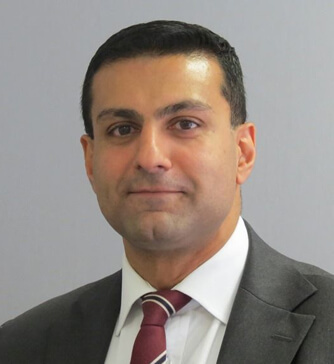 He is a member of the BSG (British Society of Gastroenterology) oesophageal committee and coordinates several highly acclaimed live endoscopy workshops at UCLH every year. • Palliation of symptoms with endoscopic therapy for patients with Oesophageal cancer with stents and laser therapy. • Gastrointestinal fistula repair with endoscopic suturing.